Firefighters, like most everyone else, have a commonsense, everyday understanding of energy, heat and temperature. However, this everyday understanding is likely to be considerably different than the way these concepts are defined and used in science. Think about how heat and temperature are used on a day-to-day basis. On a sunny summer day, people are likely to say that it is hot because they feel hot or because the thermometer indicates a temperature is high. This may lead people to believe that temperature is a measure of hotness or heat. On the other hand, scientists view these concepts considerably differently! So what! What difference does it make if we use our commonsense, everyday understanding of energy, heat, and temperature in our effort to make sense of fire dynamics? Why is this important? If you are going to take a trip, it is useful to understand the concept of distance and have some type of units (e.g., kilometers or miles) to describe how far away your destination is. When describing a building, firefighters indicate the number of stories and dimensions (e.g., meters or feet). Having a good grasp of the concepts of energy, heat and temperature provides a way to describe the fire potential of different types of fuel, the size of a fire in terms of energy and power, and the thermal environment encountered by firefighters. Take a minute and think about how you would define energy, heat, and temperature. Write your ideas down on a piece of paper so you can come back to them later. Don�t worry about the textbook definition, just write down what you think these words mean. After reading the rest of this post, come back to your notes and see how your understanding of energy, heat, and temperature has changed. For many years, firefighters in the United States learned about British thermal units (Btu) as a measure of energy. A British thermal unit is the amount of energy required to raise the temperature of 1 pound of water (at 60o Fahrenheit (F)) 1o F. Firefighters often can state a reasonable approximation of this definition and the Btu seems to be a fairly simple unit of measure with direct applicability in the firefighting context. �Before an observer can formulate and assent to an observation statement, he or she must be in possession of the appropriate conceptual framework and a knowledge of how to appropriately apply it� (Chalmers, 1999, p. 11). It is one thing to recognize a definition, but it is another thing entirely to be able to use this information in a broader context and make sense of things! For example a young child may be able to identify a red apple, but may not have a good understanding of what makes this fruit an apple (as opposed to a pear) or how a red apple and a green apple can both be apples. Developing an understanding of the fundamental scientific concepts that underlie fire dynamics and firefighting is much the same. Knowledge and understanding must extend beyond simple recognition of, or the ability to restate definitions and concepts presented in a text of lecture. Thermodynamics is a branch of physics that describes processes that involve changes in temperature, transformation of energy, and the relationships between heat and work. Fire and firefighting also involves changes in temperature, transformation of energy, heat and work. �Thermodynamics, like much of the rest of science, takes terms with an everyday meaning and sharpens them � some would say, hijacks them � so that they take on an exact unambiguous meaning� (Atkins, 2007, p. 3). Thermodynamics deals with systems. 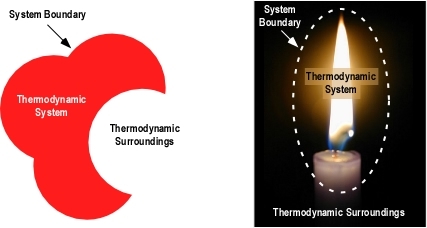 A thermodynamic system is one that interacts and exchanges energy with the area around it. A system could be as simple as a block of metal or as complex as a compartment fire. Outside the system are its surroundings. The system and its surroundings comprise the universe. While in general terms the universe includes everything, we will generally look at things on a smaller scale. For example we might consider a burning fuel package as the system and the compartment as the surroundings. On a larger scale we might consider the building containing the fire as the system and the exterior environment as the surroundings. Thermodynamic systems can be classified on the basis of their interaction with the surroundings. Isolated systems do not exchange energy or matter with their environment. Closed systems exchange energy but not matter with their environment. Open systems exchange energy and matter with their environment. A boundary allowing matter exchange is called permeable. Laws of Thermodynamics: These laws summarize the properties of energy and its transformation from one form to another. Numbered from zero to three, these laws are both simple and extremely complex. This series of posts examines the laws of thermodynamics in the context of fires and firefighting to move from theoretical to practical application. Energy is a fundamental concept in physical science, but is difficult to define in a way that is meaningful on an everyday basis. Energy is the ability to do mechanical work or transfer thermal energy from one object to another. Energy can only be measured on the basis of its effects. There are basically two kinds of energy, kinetic and potential. Kinetic energy is associated with motion of an object and potential energy is that which is stored and may be released at a later time. Work involves force causing movement in the direction of that force. If the force does not influence movement in the direction of the force, no work was done. Newtons (named after Isaac Newton) are the standard international (SI) unit for force. A Newton is the amount of force required to give a mass of one kilogram an acceleration of one meter per second squared. However, it may be easier to visualize force in terms of weight. In our everyday environment, weight is the force exerted as a result of our mass and the effects of gravity. For example, a kilogram (which is a unit of mass) exerts a downward force of 10 Newtons (or 2.2 pounds). To make things more complicated, kilograms are used in everyday language to express weight (rather than Newtons). This is because on earth, weight and mass are directly proportional. The SI unit for energy (capacity to do work) is the Joule. A Joule is a force of one Newton causing displacement of an object a distance of one meter. For example, approximately one Joule of energy is required to lift a small apple (which weighs one Newton (or 0.22 pounds) a distance of 1 meter. In that energy is the capacity to do work, the Joule is also used to measure energy (regardless of its form). While mechanical energy may be of interest to firefighters, what does this have to do with thermal energy and fire behavior? One really big puzzle is how Joules which are defined in terms of mechanical energy can be used to measure thermal energy? This is a really good question, but several more scientific concepts are needed in order to make sense of the answer. First Law of Thermodynamics: Energy cannot be created nor destroyed only transformed from one form to another. For example, in combustion the chemical reaction between oxygen and fuel results in transformation of chemical energy to thermal and radiant energy. However, the total amount of energy remains the same. Temperature is a measure of the average kinetic energy. Temperature of any substance, whether solid, liquid, or gas, is directly related to all motion (kinetic energy) of its molecules. This is especially important for liquids and solids because the kinetic energy of these substances is almost entirely vibrational and rotational. All molecules above a temperature of absolute zero (the temperature at which molecular motion stops) are in a continual state of motion and possess kinetic energy. The Kelvin is the standard international unit for temperature. In this scale, temperature is measured in Kelvins (K), not degrees (as with the Celsius and Fahrenheit scales). While the least common in everyday use, the Kelvin thermodynamic temperature scale is important in understanding thermal energy, temperature, and heat. With the Kelvin scale, 0 K is absolute zero, the theoretical absence of all thermal energy. While the Kelvin is the standard international unit for temperature, the Celsius scale is commonly used as both an everyday (outside the United States) and scientific measure of temperature. The degree Celsius (o C) is the same increment of measure as the Kelvin, the difference between these two scales is the zero point on the scale. With the Celsius scale 0o C is the freezing point of water (273.15 K) while as previously noted 0 K (-273.16o C) is absolute zero. In the United States, the Fahrenheit scale is commonly used to measure temperature on an everyday basis. 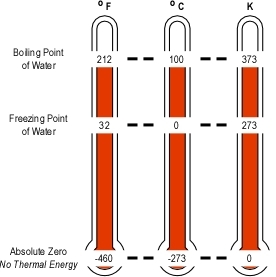 Unlike the Celsius scale where the difference between the freezing and boiling points of water is 100o, the Fahrenheit scale places the freezing point at 32o and boiling point at 212o, a difference of 180o. Note: Equivalent temperatures have been rounded to the closest whole unit (i.e., degree, kelvin). The Kelvin temperature scale is used in scientific work involving thermodynamics, because this scale starts at absolute zero (the point at which a substance has no thermal energy). This means that temperature in Kelvins is a measure of the absolute temperature. Use of an absolute temperature scale allows expression of physical laws and mathematical formulas more simply. For example, 100o C is not twice as high a temperature as 50o C (even though at first glance it appears that it is). This becomes clear when using the Kelvin scale. A temperature of 50o C is 323.15 K while 100o C is 373.15 K, an increase of just over 13% in absolute temperature. Third Law of Thermodynamics: In the complete absence of molecular kinetic energy, the temperature of a substance would be absolute zero. Absolute is 0 K or -273.15� C.
As previously discussed, the SI unit of measure for energy is the Joule (J). While defined in terms of mechanical work, the joule is used for all forms of energy. In the standard international system of units, prefixes such as kilo (thousand) and mega (million) are used to provide incrementally larger units of measure. In the case of energy, a kilojoule (kJ) would be a thousand joules and a megajoule (MJ) would be one million joules. While not commonly used in scientific work, the American fire service has typically used the British thermal unit (Btu) as a measure of thermal energy. The Btu is defined in terms of the heating effect of energy transferred to water. In order to provide a simple explanation of the Joule as a unit of measure for thermal energy and allow a direct comparison to the Btu, Figure 3 describes the J in terms of energy transfer to water and provides a comparison to the Btu. * In this case, Ounces is a measure of volume not mass (or weight). Another confusing aspect of the traditional system of measure used in the United States! As illustrated in Figure 3, addition of 4186 joule of energy to a kilogram of water raises its temperature (average internal kinetic energy) by one degree Celsius. Similarly, adding one British thermal unit of energy to a pound of water raises its temperature by one degree Fahrenheit. Directly comparing these two examples is a bit complex as the units of measure for both energy (J & Btu) and temperature (o C & o F) are different. Some properties of materials are independent of their mass, color would be one example. Other properties are dependent on mass. Weight, would be the most obvious, but other properties are also dependent on the mass of material present. Note: This illustration was adapted from a simulation in Energy: Thermal Energy, Heat and Temperature, a National Science Teachers Association knowledge object. The example provided in Figure 4 examines the difference between temperature and thermal energy as related to mass. The container labeled A initially contains a specific mass of liquid with a temperature of 30o C and a total thermal energy of 8 J. 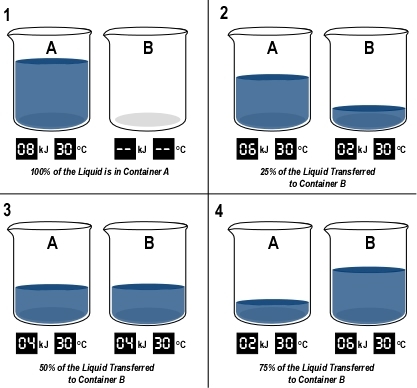 Liquid is moved from the container labeled A to the one labeled B. How does the temperature of the liquid and thermal energy in each container change as this transfer takes place? 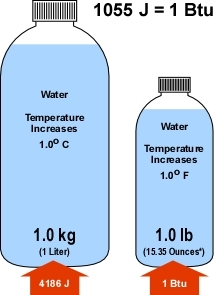 The temperature of the liquid remains the same regardless of the quantity in each of the containers. However, as the mass of liquid in each container changes, the thermal energy of the liquid in the container changes as well. Related to average thermal energy, temperature is independent of mass, while the total thermal energy relates directly to mass. Properties of materials fall into two categories. Extensive properties (like energy) are dependent on the quantity (mass) of material while intensive properties (like temperature) are not. The next post in this series will examine the concept of heat and the relationship between heat, energy, and temperature. Chalmers, A. (1999) What is this thing called science? (3rd ed.). Indianapolis, IN: Hackett. As discussed in the previous posts in this series, military battle drills are an immediate response to enemy contact that requires fire and maneuver in order to succeed. Battle drills are initiated with minimal commands from the unit leader. Soldiers or marines execute preplanned, sequential actions in response to enemy contact (see Figure 1). Battle Drill Part 2 addressed the appropriate reaction of a team of firefighters on a primary hoseline when confronted with rapidly worsening fire conditions that are not readily controllable once they occur (e.g., flashover, wind driven fire conditions). As when a military unit is ambushed, the fire and maneuver of battle drill involves more than one weapon. This post will address the role and reaction of backup lines in the extreme fire behavior battle drill. Once a hoseline has been deployed for fire attack it is good practice to stretch a backup line. Klaene and Sanders (2008) observe that backup lines are needed to protect the crew on the initial attack line and to provide additional flow if needed (p. 216). Unfortunately, many firefighters see the backup line as simply another attack line and miss the first and primary function of this hoseline to protect crews on primary hoselines. The first priority in fire attack operations is to get a hoseline in position to apply water effectively to the fire. To this end, hoselines are deployed in series (attack line first, then backup line) not in parallel, where both lines are attempting to advance and maneuver in the same space. The crew of the backup line can often assist in pulling up additional hose for the attack line (particularly when crews are lightly staffed). 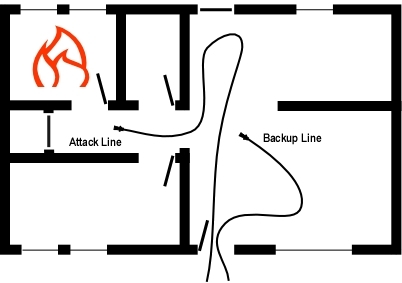 As illustrated in Figure 2, the backup line is positioned to protect the means of egress and if necessary support fire attack. As discussed in Battle Drill Part 2, the thermal insult experienced in an extreme fire behavior event is dependent on temperature (of gases and compartment linings) and flow of hot gases. The higher the temperature and faster the speed of gas flow, the higher the heat flux. Survival requires that crews on hoselines extinguish or block the flames, cool hot gases, and maneuver out of the flow path to a point of egress or area of safer refuge. Crews engaged in fire attack or search are often first to encounter rapidly deteriorating fire conditions. Hose Handling and Nozzle Technique Drill 8 outlined the immediate actions that should be taken to support a tactical withdrawal under severe fire conditions. In these circumstances, the crew staffing the backup line has a critical role in supporting withdrawing crews. Fire conditions that are beyond the capability of a single hoseline may be controlled by the higher flow rate from multiple lines. As noted by Klaene and Sanders (2008) one of the functions of backup lines is to provide additional flow if needed (p. 216). The attack line and backup line operating in a coordinated manner may be able to control fire conditions and allow continuation of fire attack. If this is the case, these lines should be reinforced by deployment of one or more additional backup lines. If fire conditions cannot be controlled, and the attack line must be withdrawn while maintaining water application to protect the crew, the crew on the backup line can aid in withdrawal of attack and/or search hoselines. If the hoseline is not withdrawn as the firefighter on the nozzle retreats, the hose may kink or become exposed to flames (either of which may result in loss of water supply to the nozzle). While the attack or search crew is likely to be first to encounter worsening fire conditions, this is not always the case. 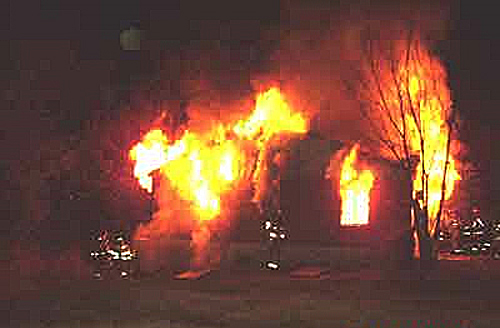 Depending on fire location and building configuration, fire spread may cut off the attack or search line from behind. In this situation, the backup line becomes the primary means of defense for operating crews. Regardless of how deteriorating conditions develop, safe and effective tactical withdrawal requires a coordinated effort between interior crews and as soon as possible, report of conditions to Command and if necessary transmit a Mayday message. Drill 9-Extreme Fire Behavior Battle Drill-The Backup Line: Key hose handling and nozzle techniques when faced with extreme fire behavior are the ability to apply long pulses of water fog or maintaining a continuous flow rate while maneuvering backwards. However, the backup line may initially need to advance to support fire attack, and then if necessary cover and support other crews as they withdraw. Skill in operation and maneuver of a single hoseline is a foundational firefighting skill. However, in the extreme fire behavior battle drill, coordinated operation of the attack and backup line is essential, making Hose Handling & Nozzle Technique Drill 9 an important step in skill development. Klaene, B. & Sanders, R. (2008) Structural Firefighting Strategy and Tactics (2nd ed.). Sudbury, MA: Jones & Bartlett. As discussed in the last post in this series, military battle drills are an immediate response to enemy contact that requires fire and maneuver in order to succeed. Battle drills are initiated with minimal commands from the unit leader. Soldiers or marines execute preplanned, sequential actions in response to enemy contact. This post discusses application of the battle drill concept in training firefighters to react appropriately on contact with our enemy (the fire) which requires fire (application of water) and maneuver (movement to a safer location) in order to succeed. Remember: The key elements of a battle drill are fire and maneuver! This requires the ability to operate and maintain control of the hoseline while moving backward. In the United States, it is common for some companies working on the fireground to operate inside burning buildings without a hoseline (particularly when performing search). While common, this practice places firefighters at considerable risk when faced with extreme fire behavior. Without a hoseline your only defense against rapid fire progress is recognition of developing conditions and immediate reaction to escape to a safer location (see video below); which is not always possible. In some cases, firefighters fail to recognize developing conditions or the speed with which conditions will change. In other cases, firefighters are unable to escape or take refuge outside the flow path of hot gases and flames quickly enough. If your department’s operational doctrine includes companies working on the interior without a hoseline (or without being directly supported by a hoseline), it is essential that firefighters are trained to 1) recognize early indicators of potential for extreme fire behavior and 2) maintain a high level of awareness regarding locations which may provide an area of refuge. When confronted by rapidly worsening conditions, action to escape must be immediate and without hesitation. In situations where you were unable to recognize potential for extreme fire behavior or you have been unable to control the fire environment, immediate action is required! I will use my nozzle effectively and efficiently to put water where it is needed. I will learn its weaknesses, its strengths, its parts, and its care. I will guard it against damage, keep it clean and ready. This I swear. As stated in the first paragraph of this adaptation of the United States Marine Corps Riflemans’ Creed, Without my nozzle I am useless. The extent of thermal insult experienced in an extreme fire behavior event is dependent on both radiant and convective heat flux. Total radiant heat flux is dependent on temperature (of gases and compartment linings) and flow of hot gases. The higher the temperature and faster the speed of gas flow, the higher the heat flux. These scientific concepts drive the key elements of the extreme fire behavior battle drill. Extinguish or block the flames, cool hot gases, and maneuver out of the flow path to a point of egress or area of safer refuge. Drill 8-Extreme Fire Behavior Battle Drill: Key hose handling and nozzle techniques when faced with extreme fire behavior are the ability to apply long pulses of water fog or maintaining a continuous flow rate while maneuvering backwards. This requires a coordinated effort on the part of the nozzle operator, backup firefighter, and potentially other firefighters working on the hoseline or at the point of entry. While this drill focuses on single company operations, it is important to extend this training to include crews operating backup lines. The importance, function, and operation of the backup line will be the focus of the next post in this series. When training to operate in a hazardous environment, avoid the mindset that it’s only a drill. As often observed, you will play the way that you practice. Extreme stress can activate inappropriate routine responses. For example, a Swedish army officer suddenly stood up while his unit was under fire while engaged in peacekeeping efforts in Bosnia. When asked about this response, he explained that in training, he often stood up while leading exercises (Wallenius, Johansson, & Larsson, 2002). “A simple set of skills , combined with an emphasis on actions requiring complex and gross motor muscle operations (as opposed to fine motor control), all extensively rehearsed, allows for extraordinary performance levels under stress” (Grossman, 2008, p. 38). When developing skill in nozzle technique and hose handline, and in particular the critical skills required to effectively perform this extreme fire behavior battle drill, it is essential to maintain critical elements of context such as appropriate use of personal protective equipment, position, and technique. Grossman, D. (2008). On-combat: The psychology and physiology of deadly conflict in war and peace. Millstadt, IL: Warrior Science Publications. Wallenius, C. Johansson, C. & Larsson, G. (2002). Reactions and performance of Swedish peacekeepers in life-threatening situations. International Peacekeeping, 9(1), 133-152. NIOSH has investigated a number of incidents in which firefighters trapped by rapid fire progress did not take appropriate survival action. Last September, I was reading NIOSH Report F2007-02, which outlined the circumstances surrounding the death of Firefighter Steven Solomon in Atlanta, Georgia. Firefighter Solomon was severely burned after being caught by rapid fire development while advancing an attack line in a vacant structure (see Figure 1). Firefighter Solomon was on the nozzle as the first arriving truck removed the plywood covering the front door and thick, black smoke came rolling out the top of the doorway. Firefighter Solomon and the crew of Engine 16 advanced the line into the building as the truck continued horizontal ventilation. After advancing a short distance, fire conditions quickly worsened and the crew attempted to back out, but collided with another company who was advancing a backup line. After exiting the building the crew of Engine 16 realized that Firefighter Solomon was still inside. Crews outside the door on Side A observed the silhouette of a firefighter running through the flames inside the building. Failure to recognize the signs of an impending flashover/flameover. Inadequate communication on the fireground. Possibility of ventilation induced rapid fire progression. While these factors likely contributed to Firefighter Solomon’s death, I still did not have a solid answer to my question of how a firefighter on a hoseline just a short distance inside the doorway could have died in this type of event. The best way to avoid being injured or killed in an extreme fire behavior event is to read the fire, anticipate likely fire behavior, and control your operating environment. A majority of our effort should be spent on mastering these skills. There is no unpredictable fire behavior. Under the same conditions, a compartment fire will develop and behave consistently. However, conditions are not always the same! In addition, firefighters operate with limited information, imperfect skill in anticipating likely fire behavior, and often under pressure to take rapid action. When making decisions under pressure, in a complex and dynamic environment, and with limited information, potential for error increases. 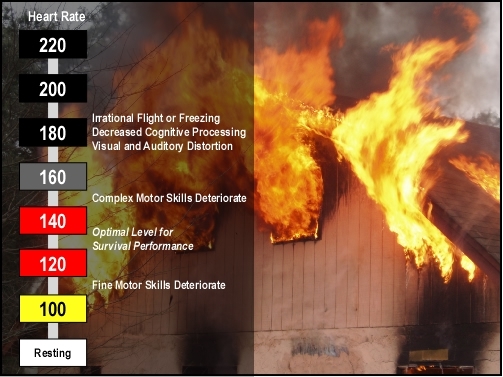 Improved understanding of fire dynamics and development of a high level of skill reduces, but does not eliminate your risk of encountering extreme fire behavior. When this occurs it is essential that firefighters understand the fire behavior, their own reactions to stress, and have well practiced (to automaticity) responses to increase the chance of survival. What exactly are firefighter survival skills? Firefighters may encounter a number of life threatening problems while operating in the hazardous environment of as structure fire. Threats include breathing apparatus emergencies (e.g., malfunctions, running out of air), becoming disoriented, and being trapped by collapse or rapid fire progress. These techniques may provide useful in dealing with a number of the threats that may be encountered in a structure fire. Taking refuge in an uninvolved compartment (with the door closed) may buy time for firefighters to escape through a window. However, the other elements will have little impact on increasing survival potential when encountering extreme fire behavior phenomena. What is the missing element in the typical survival skills curriculum? 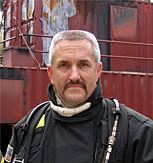 In some cases, firefighters are taught breathing techniques to control their respiratory rate and conserve air, but little emphasis is provided on the psychological and physiological effects of the stress encountered in life threatening situations. This is critical to survival regardless of the nature of the threat. When faced with extreme fire behavior, particularly wind driven flames, flashover, and flash fire, appropriate nozzle technique and immediate tactical withdrawal to a safer area is absolutely critical. However, most survival skills curriculums do not address these critical skills. When was the last time you practiced withdrawing a hoseline while operating the nozzle in the context of offensive, interior firefighting operations? Increased psychological and physiological arousal prepare the human body for action. As this occurs, the sympathetic nervous system increases heart rate and blood pressure to maximize the body’s physical capacity. However, extreme levels of stress can result in significant deterioration in performance. In On-Combat: The Psychology and Physiology of Deadly Conflict in War and Peace, LT COL Dave Grossman (2008) identifies five levels of arousal designated Conditions White, Yellow, Red, Grey, and Black. While cautioning against fixing specific heart rate numbers (or other precise physiological measures) to these levels of arousal, heart rate can be used as an indicator (see Figure 2). Note. Adapted from On-Combat: The Psychology and Physiology of Deadly Conflict in War and Peace (p. 31), by Dave Grossman, 2008, Millstadt, IL: Warrior Science Publications Copyright 2008 by David A. Grossman. When face with an immediately life threatening situation, the resulting stress can significantly impact an individual’s ability to respond appropriately. In addition to the physiological responses (e.g. increased heart rate, visual and auditory distortion) decreased cognitive processing may delay appropriate response or result in freezing, with the inability to act (Wallenius, Johansson, & Larsson, 2002). Recently a colleague related the experience of a firefighter who had been trapped by a wind driven fire. The firefighter dropped to the floor, went into the fetal position, said goodby to his wife and children and thought he was dead. Fortunately, the firefighter was rescued, but this illustrates the potentially incapacitating effects of stress in life threatening situations. What is the answer? Military research points to the need for a highly trained (to automaticity) response. Battle drills integrate these immediate individual actions in the context of small unit operations. In a military context, battle drills are an immediate response to enemy contact that requires fire and maneuver in order to succeed. Battle drills are initiated with minimal commands from the unit leader. Soldiers or marines execute preplanned, sequential actions in response to enemy contact. 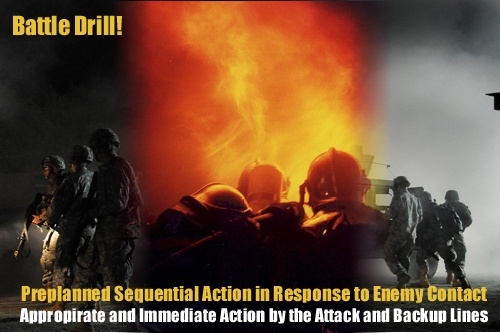 The battle drill concept has direct applicability to training firefighters to react appropriately on contact with our enemy (the fire) which requires fire (application of water) and maneuver (movement to a safer location) in order to succeed. Unless a barrier (such as a door) is available to block the flow of flames and hot gases towards the firefighters position, attempts to escape without protection from a hoseline are likely to fail as fire can spread far more quickly than you can move. The next post in this series will return to hose and nozzle drills with development of a battle drill for response to rapid fire progression. Ed Hartin, MS, EFO, MIFireE, CFO.